So last night, the husband says “you know what? we haven’t got enough books”. I look around our small apartment. The bookshelves are bulging, the coffee table is covered in books, the floor under the coffee table has stacks of book, my bedside table is covered in books, husband’s desk is covered in books, our apartment looks like a library threw up. It’s a miracle the kitchen table and chairs aren’t covered in books. While I’m working on a review, here’s a few items that recently snuck into the apartment, while I wasn’t looking, of course. Most of this batch falls under the category of borrowed. Have you read any of these? which do you recommend? which look interesting? what should I dive into first? what should I skip? A Guile of Dragons – this is the new from from James Enge, creator of Morlock Ambrose. This appears to be first in a new series, although connected to his previous Morlock books. I read The Wolf Age and Blood of Ambrose, and while I remember them being entertaining, I also remember Enge having some major pacing issues. Let’s hope he’s worked those out. 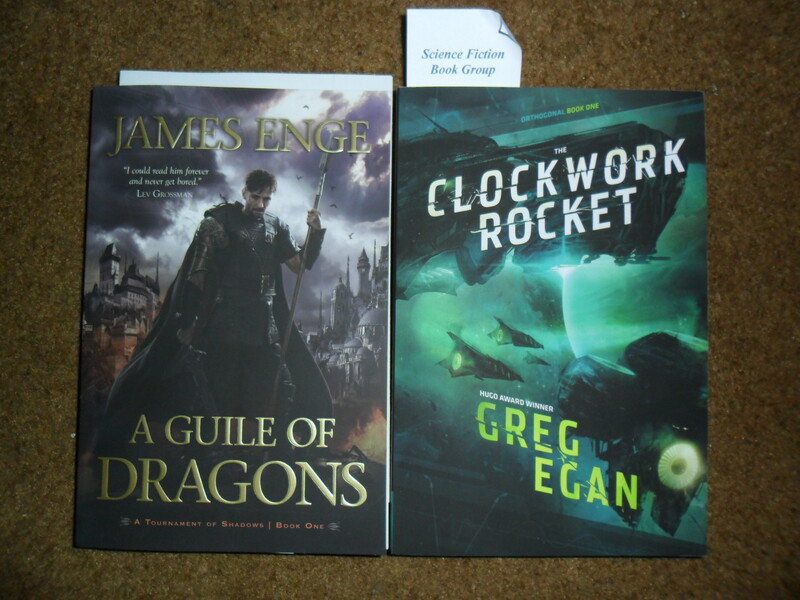 Clockwork Rocket by Greg Egan – high priority to read, as it’s my local scifi bookclub’s choice for Sept. This seems to be a relativistic story of beating time by changing how fast it moves (in relation to you, of course). I have high hopes. 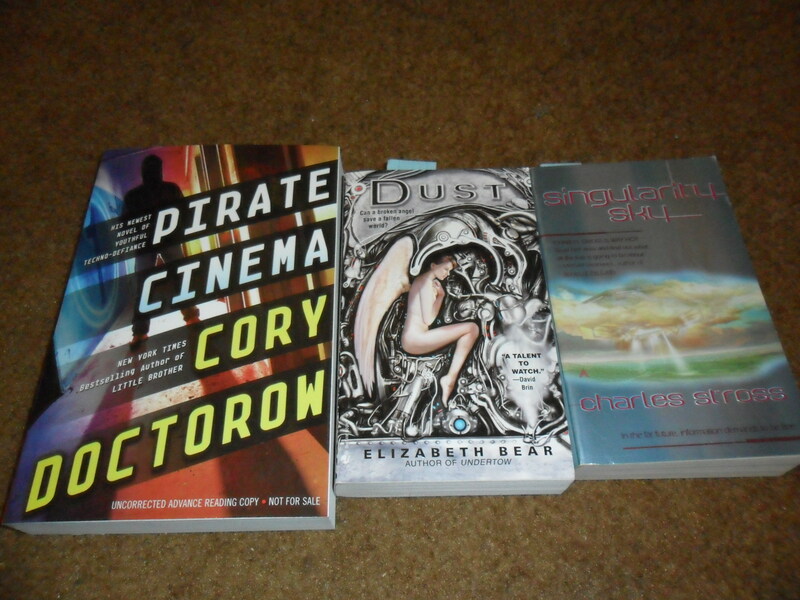 Egan has about a dozen books out so far, anyone read any of them? This will be my first by him. Where I got it: received review copy from PYR. Eminently readable as a stand-alone novel, there’s a lot going on in The Wolf Age. A lot of plot, a lot of subplot, a lot of subterfuge and characterization and trope-bashing and wonderfulness. I’m going to keep my plot comments minimal, so as to not spoil anything, and more importantly so I can get to the meat of what’s going on here. The as promised, spoiler-free plot summary: When Morlock tries to rescue some slaves, he finds himself captured, and having had a glass spike hammered into his head he loses his Sight, and gains the mother of all headaches. Thrown into prison in the werewolf city of Wuruyaaria, Morlock is seen as a freak, and is used to terrify the other prisoners. One prison break later,and Morlock is living with some other escapees in the slums outside the city walls. And it’s an election year. Ever been to an election in a werewolf city? They are dangerous, loud, full of muckraking, and occasionally violent. Actually, not so foreign feeling after all. And maybe it doesn’t matter, but the Strange Gods and the werewolf maker God Ulugaariu are having a little war over the fate Wuruyaaria as well. The Strange Gods don’t really care about the men who follow them, almost as much as Ulugaariu does care about the werewolves who follow him. You will love the Strange Gods and all their flaws. itsy bitsy spoiler – you’ll meet Ulugaaria and witness some truly beautiful and heartbreaking dialog. But none of that is really the meat of what’s going on here. The super quick version of this review is “last 100 pages more than makes up for first 100 pages”. the beginning of Blood of Ambrose didn’t do a damn thing for me, but the end knocked my socks off in a most supercalifragalistic away. We start off with young King Lathmar, who at age eleven has already been orphaned and thus inherited a small kingdom and a regent known as The Protector. Raised to be a figurehead and nothing more, Lathmar is naive, sheltered, and rather whiny and annoying. The Protector, Urdhven, has more ambitions than brains and figures taking the kingdom from Lathmar will be like taking candy from a baby. Urdhven’s got some special help, as well. Luckily, Lathmar’s true protector is his great so many times grandmother (who he just calls Grandmother), Ambrosia Viviana. In their time of need, Ambrosia tasks the frightened Lathmar with calling to her brother, knowing he will come and save them. Enge flounders with worldbuilding and characterization at the beginning, and this will be a turn off to a lot of readers. Unless you’ve already read Enge’s short fiction, you don’t know who any of these people are, you don’t know why you should care, and worst of all you have no idea where any of this is heading. But trust me, you need to keep reading, because it gets better. much better. Ambrosia Viviana’s brother is Morlock Ambrose, sorcerer, master maker, drunkard, child of Merlin. Morlock the exile, the Crooked Man whose magic has destroyed cities and empires. One must truly be in dire straights to call on his twisted help. There’s a reason he’s the star attraction stories parents tell to frighten their children.